​Lorna and James Brokenshire-Dyke, from Newmarket, set a new Guinness World Record (awaiting official verification) for Fastest Three Legged Marathon. 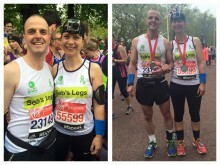 Three-legged London Marathon to raise money for 2 year old son who has cerebral palsy spastic diplegia. Cerebral palsy sufferer Sophie Thomlinson will finally have the operation she needs. A gruelling climb to raise funds for the surgery needed to help young Seb walk. #valentinesday 10 Brides have entered a 'Win Your Wedding' fundraising competition. They exchanged a £10 donation to enter and each couple now has 4 weeks to fundraise for Tree of Hope to support James Burns Wish to Walk. My friend Graham and I are going to ride two Royal Enfield Bullets to Gallipoli in time for the commemoration marking the centenary of the WW1 campaign at that location raising money for "Foot Steps for Roxy". Little Alfie Smith is desperate to play football with his friends – but he suffers from a rare condition that means eating a burger or even drinking too much milk could damage his brain. Five-year-old boy walks for the first time A boy with cerebral palsy can walk for the first time thanks to a life-changing operation in the US paid for with the help of Sunday Express readers. Three of us have decided that something crazy was in order to get this little soldier Jack on the move. So we are taking ourselves and our three unreliable cars on probably the longest journey of our lives in an effort to change just one.